These chocolate brownies have a delectable pumpkin seed layer, which makes them anything but ordinary! 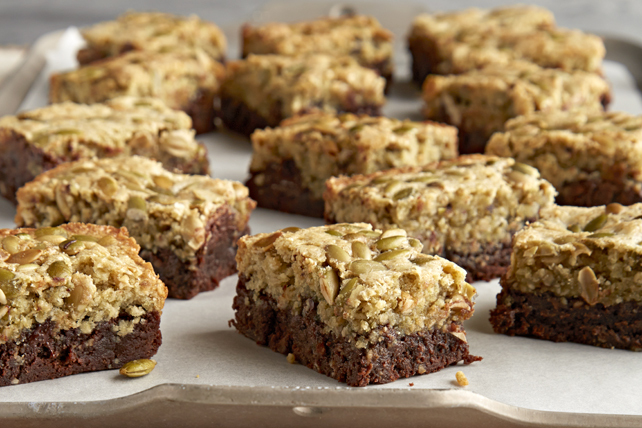 Give our Layered Pumpkin Seed-Chocolate Brownies a try! Line 13x9-inch pan with foil, with ends of foil extending over sides; spray with cooking spray. Microwave unsweetened chocolate and 3/4 cup butter in large microwaveable bowl on HIGH 2 min. or until butter is melted. Stir until chocolate is completely melted and mixture is well blended. Add 2 cups sugar; mix well. Blend in 3 eggs and vanilla. Add 1 cup flour and cinnamon; mix well. Pour into prepared pan. Use pulsing action to process 1-1/2 cups pumpkin seeds and remaining sugar in food processor until seeds are finely chopped. Add remaining butter and eggs; pulse just until blended. Spoon into medium bowl. Add baking powder and remaining flour; mix well. Stir in semi-sweet chocolate. Spoon semi-sweet chocolate mixture over batter in prepared pan; sprinkle with remaining pumpkin seeds. Bake 40 to 50 min. or until toothpick inserted in centre comes out with fudgy crumbs. (Do not overbake.) Cool completely. Use foil handles to remove dessert from pan before cutting into 36 brownies to serve. Satisfy your sweet tooth with one serving of these luscious brownies, featuring chopped chocolate, ground cinnamon and toasted pumpkin seeds. Mix 1/8 tsp. cayenne pepper with brownie batter before pouring into prepared pan and baking as directed.